cabinets - Do you know the cabinet color? Please provide paint color for these cabinets - beautiful! 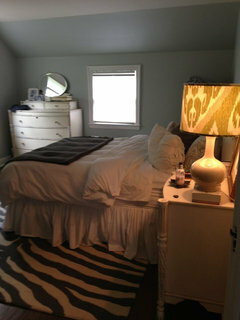 Color of cabinets is Linen White by Benjamin Moore per another question answered by the designer. Cabinet paint - Can you please tell me the color of the cabinets? We are building a home and doing hours and hours of research. Then I happened upon your fabulous cabinets (and color)! Do you know if they are custom? Simply beautiful! nevermind the question....just read further! I love the pulls:) Did you use the low-gloss or the subtle velvet for the kitchen? Two pulls would look silly. Counter tops - Is soap stone a viable option for a family of 5? Does it require much care? We have had soapstone for about 10 years. Fantastic. We tested it with enchilada sauce and anything else our kids would spill. It is what they make chem lab counters out of. They will get some mineral deposits over the years by faucets. We love the texture of the natural stone. You can seal it but we prefer it the way it is. Cabinet wall width - Can you tell me the entire width of the cabinetry on this wall? I really love this look! what is the standard height for a double oven? Unfortunately there isn't a standard height of a double oven. It all depends on the model and brand. Bed in front of window? - Hi I would like put my bed in front of this tiny window (see pic) I have a iron head board that I can paint any color and I'd like to put curtain panels on the window to create a softer vibe and coziness. My ? Is should I do small valance too? Anyone have any good inspiration photos of a bed up against a window that also happens to be slanted?! I see pics of one or the other but never both. Btw I'd like to move my bed there to create more space in the room. It's a bit cramped w the bed where it is now. what is he beautiful paint color on walls? Hi there, we don't have that information any more, sorry! Color of walls - Could you please tell me the color of the walls? Pulls - Tell me about The pulls. Are them from Restoration Hardware? Coffee machine - Can you tell me what is the wall coffee unit? Hope that helps? Looks great and the coffee isn't bad either! Who is the cabinet manufacturer and door style - Love these cabinets and teh hinge details. Do you know who they are by and the door style? Thanks. Love the clean look of those ovens. What brand of ovens are those? What type of flooring did you use here? Beautiful. Is this a Plato kitchen? Window trim paint - It looks like the trim color around windows is a brighter white than cabinets. Is this true? Cabinet color - What is the color of the cabinets? It makes the kitchen feel very warm and inviting. I love it with the soapstone! What is the name of the color of the soapstone? Hinges - What finish are the hinges? Is it ok if they're a different finish than the pulls? 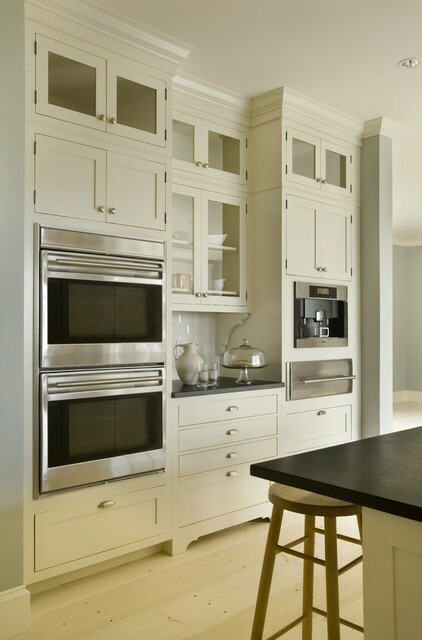 Warming drawers are separate appliances and are often installed to match the wall oven, as shown in this country-style kitchen.